This dish will totally change your views on cauliflower. Roasting the cauliflower versus boiling caramelizes the cauliflower, giving it a nutty flavor with crispy edges! It truly is a versatile vegetable that will take on any flavor and color you decide to season it with. Cauliflower can be used as a mashed potato substitute or even can be made into a great and healthy alternative to a gluten free pizza crust! Bake it, fry it, mash it, puree it, steak it- whatever you decide you will never become bored with this veggie! Plus it is great for digestive support with its fiber content and has anti-inflammatory properties. I chose to pair the cauliflower steak with ginger and turmeric because not only are they great spices that give any meal a warm and colorful flavor, but they have many health promoting properties. The two spices have anti-inflammorty properties and can help sooth upset digestive systems- which is great for those who suffer from IBS and the like! *I added more ginger & turmeric. Adjust to your personal preference & taste. Pre-heat the oven to 400 degrees. Line a baking sheet with parchment paper & set aside. In a bowl, mix together the olive oil, turmeric, salt, pepper, ginger, juice of a lemon, and lemon zest. Adjust to taste. Set aside. Carefully remove the leaves from the cauliflower & trim the stem if needed. 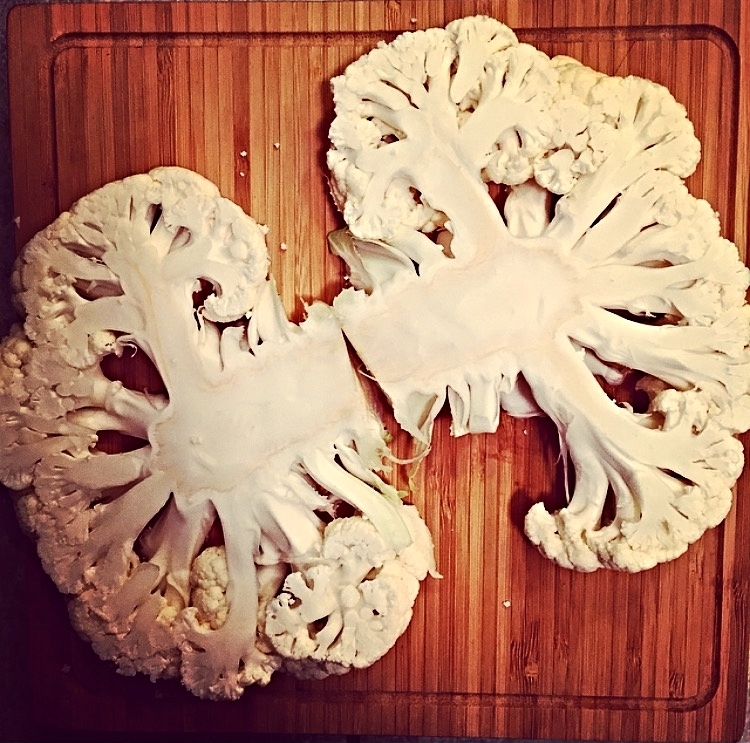 Place the cauliflower, base side down, on a cutting board. Starting at the top center of the cauliflower, cut down the center to divide in half. Then carefully cut into 3/4 inch thick slices. (I was able to cut 4 slices) You can cut the remaining florets to roast or save them for a later use. Over medium- high heat add 2 tbsp. of either coconut oil or olive oil. 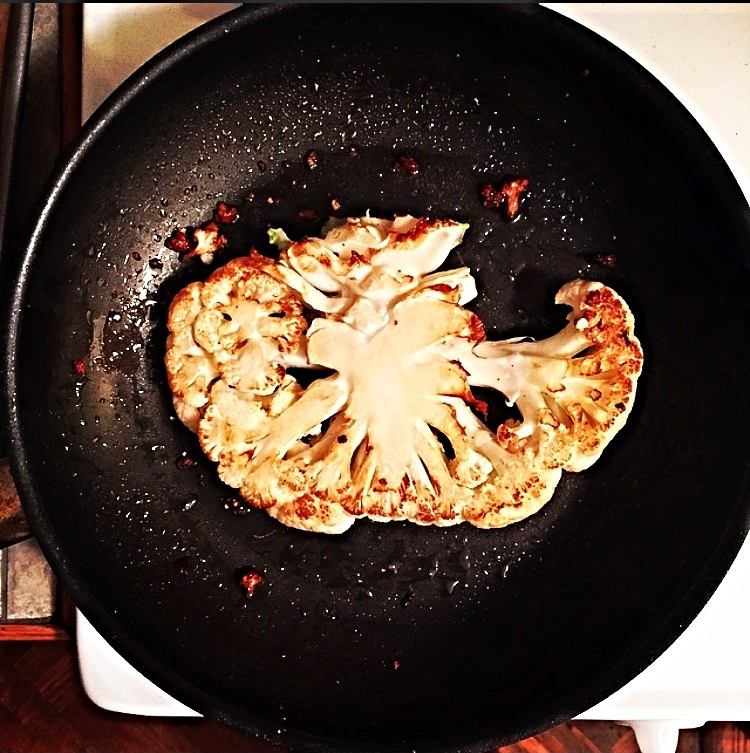 Depending on the size of pan, only place 1-2 of the cauliflower steaks in the oil. Cook on each side for 3-4 minutes, or until they are golden brown. Remove from pan and place on the baking sheet. You may need to add more coconut oil or olive oil in between each round. Once all of the cauliflower steaks are on a baking sheet, brush with the turmeric, ginger, olive oil dressing. You may need to make more. I generously coated each of the steaks to intensify the flavor. Mince the garlic and spread over the cauliflower steaks. Place the pan in the over and roast for about 15-25 minutes. Once the cauliflower steaks are tender/slightly crispy and have developed a deep golden brown color- they are finished. Remove from baking sheet & serve! You can serve the cauliflower steaks as a great vegetarian friendly main meal over a bed of wild rice, salad, quinoa, or chickpeas! The options are endless- be creative!